Sir loves his “things that go,” and he has no lack of toy cars, including construction equipment and tractors. It’s fun to watch his play continue to be more creative, but something is missing from his collection — toy bicycles. We do what we can, lifestyle-wise, to share our love of bicycle transportation with our son, but I feel like the car culture is so predominant that we need every advantage we can get, including incorporating bicycles in play time. Over the past year-and-a-half, I’ve been disappointed by the lack of toy bicycles. I’m relatively certain (and have some evidence) that toy bicycles would be just as exciting as toy cars, but he can’t play with them if he doesn’t have them (or if they don’t exist). My sister found this cute model BMX bike at a thrift store or garage sale last year. We don’t know much about it’s origins, but a bit of use quickly showed that it was more for decoration than play (or at least not up to toddler play), as more and more parts fell off (first the pedals, then the rear wheel, then the handlebars). I couldn’t figure out any fixes that really made it usable, nor could I purchase a replacement, so it was back to the drawing board . . . .
A little bit of digging uncovered this post, from a family with a similar mindset, seeking toy bicycles to add for their kids. 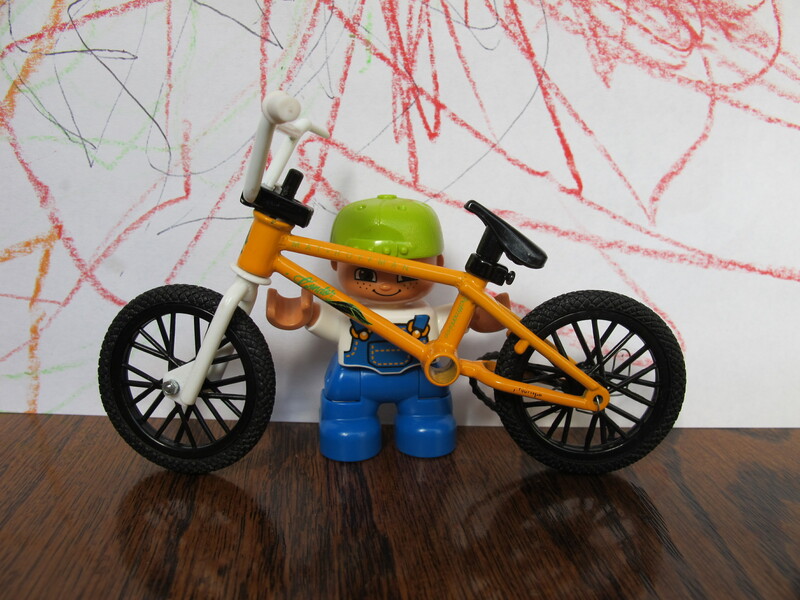 They shared links to some options from Playmobil including a child biking to school and a bicycle pulling a trailer. I also found some information on model bicycles, which may be a good option for when Sir is a bit older. In this realm, there are some great options here, especially the set of four with a trailer and the family with mom, dad, baby, and trailer. Also, a few things here. So, while there are some options out there, I would love to see toy manufacturers do better in this area, especially those that claim to be “green.” How green is it if you only make toys that reinforce the idea that we have to drive a motor vehicle everywhere? This entry was posted in Biking and tagged fighting car culture, toys. Bookmark the permalink. I’d never really thought about the messages that the toys we give to our children influence them, of course toy cars fetishize the car as a transport mode! What a great post! I don’t have kids so this never really crossed my mind until you wrote it! I just tweeted it (I’m @echointhecity). It’d be great for more bike toys! Hi, thanks for stopping by! There’s definitely an imbalance in the toys that are offered, and, while subtle, that sends a message to children. While I mention toy manufacturers in the post, I could also see a role for bicycle manufacturers in creating toy bikes. Thаnks for finally writing abߋut >Toys that don�t reinforce thhe ϲar culture | Ηer Green Life <Liked it! My kids are older, not toddlers. We have a Barbie bike. My girls saw one in the store with a trail-a-bike for Skipper. The girls also have Lego Friends with bikes. We have friends who found an American Girl bike at a garage sale. My boy has some BMX type action figures with bikes. You’re right though, there’s not as much out there. Like the idea of looking toys that don’t reinforce car culture!